About four years ago one of the world leaders in the production of brake discs in the Automotive sector asked Lasit for a laser marker that observed the precise technical parameters and could be integrated into a massive production chain. We therefore designed and built FlyRoller for laser marking DataMatrix, customized ad hoc to meet the criteria of efficiency and reliability required. The machine consists of a marking cabin and a motorized roller conveyor. The cabin is equipped with Y and Z axes with vision system, while the roller conveyor works with two robots: one loading the incoming disk and the other picking it up after marking and check. One of the strengths of this marker is the customized software that interfaces with the customer's database and has a Profisafe communication protocol. We have made this laser marker by equipping it with Y and Z axis with servomotors with encoder, which move the laser to the marking position: the useful stroke of the Y axis is 448mm, for Z axis it is 180mm. This is essential for laser marking discs of different sizes. The machine works with a robot, which positions the piece on the conveyor avoiding the need to do it manually. Once the sensors have detected the presence of the disk, the conveyor belts move until the introduction of the piece into the cabin. At this point the sensors detect the position of the pieces and the Feed separator regulates the entry into the cabin of only one component at a time. Of course the dimensions of the brake discs to be marked can change, so we have equipped the conveyor belts with adjustable abuts that are set through the Software, in this case the minimum diameter is 250mm going up to a maximum of 500mm. The design of Flyroller set us ahead of a technical and design challenge that we can say we have successfully won. We have created a laser marker with perfectly integrated and cooperating systems, both from a mechanical and a technique perspective related to the Software and its customization. When the disk enters the marking cabin it is blocked by a pneumatic system and framed by a side camera connected to the Software. This has a double function: firstly, it allows the correct positioning of the laser and direction of the spot. 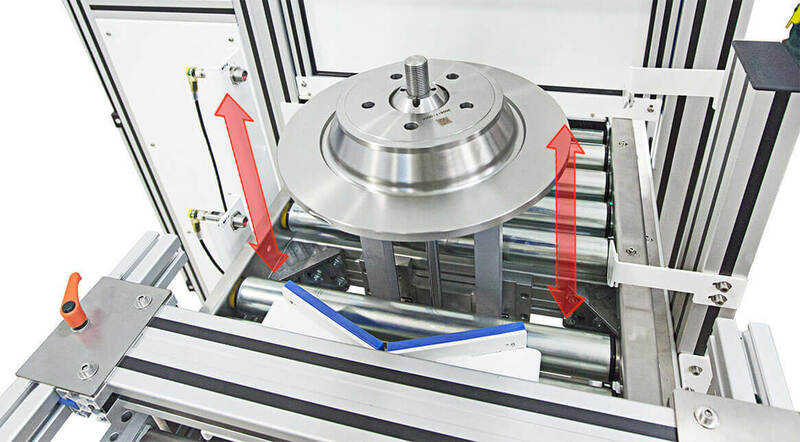 Subsequently, once the laser marking of DataMatrix has been completed, the result is checked: if the quality is lower than the one set, the machine automatically remarks on the brake disc oriented at a previously established angle. In this way there is no risk of introducing discs with illegible or more easily damaged markings into the complex production process. We have equipped the machine with a lift which lifts the disc from the snare drum and puts it in the entry position to the next step in the chain. 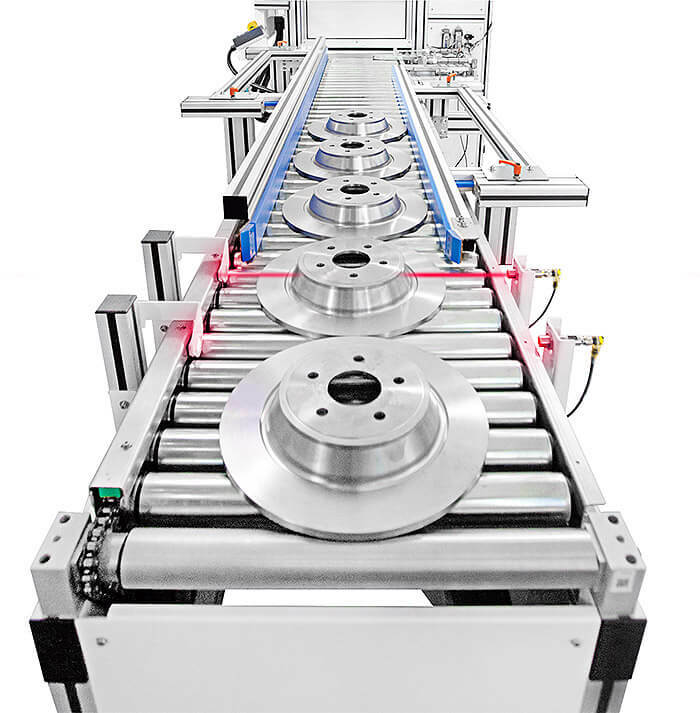 Before the perfectly marked disc leaves the Flyroller, the marker checks its positioning thanks to two vision systems. Once lifted, the piece is framed by the first camera from above: if the position is not the one set, this is automatically corrected by rotating the disk. 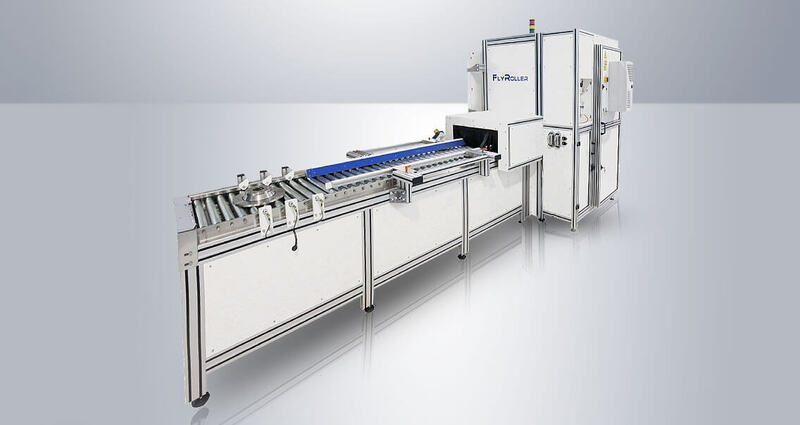 The Flyroller is part of a production process in which reliability plays a fundamental role. Any error of the laser marker would compromise the entire system, with damage both in terms of time and money. The fact that the company now has more than 30 LASIT markers is proof of our great experience in creating and customizing machines for a sector such as the Automotive. The second camera instead works differently: there is a balance notch on the disc that is identified by the vision system, when this happens the rotation stops automatically and the piece is transported out of the marker. The safety of the machine is managed entirely in Profisafe, that is a communication protocol between PLCs to manage the safety system avoiding the wiring with external components. We have made this laser marker by equipping it with Y and Z axis with servomotors with encoder, which move the laser to the marking position: the useful stroke of the Y axis is 448mm, for Z axis it is 180mm. This is essential for marking discs of different sizes.